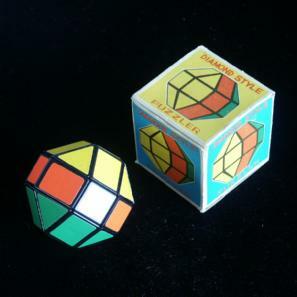 The Diamond Style Puzzler is a variant of the Rubik's Cube. It has the same mechanism but a different outward shape, namely approximately that of a Rhombicuboctahedron. This is the ball-like shape that arises when all 20 moving pieces of the cube are shaved down so that each piece is flat and has only one facelet. Thus the corners pieces have become triangular, and the edge pieces have become square (or actually rectangular) similar to the shaved edges on the Octagon/Barrel. The puzzle has a simple colour scheme where the three layers each have a single colour - the middle layer is orange, the top and bottom layers are yellow and green. There is another puzzle in my collection which is equivalent. 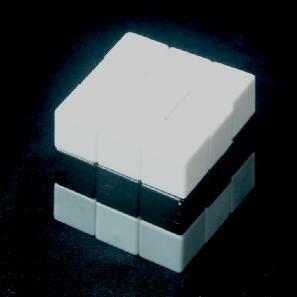 It is a Rubik's cube in which each layer is made from a different colour plastic (white, black, and grey) and does not have stickers. It was made by mixing the pieces of three types of Rubik's Cube. It was never produced commercially. There are 12 edge pieces and 8 corner pieces. The orientations are not visible so this gives a maximum of 12!8! arrangements. The limit is not reached because they all occur in sets of four indistinguishable pieces, and this leaves only 12!8!/4!5 = 2,425,500 positions. I have done a computer analysis of the Diamond Style Puzzler in order to find God's Algorithm. The results are in the tables below. Analogous to the Rubik's cube, there are two ways to count the moves. The Face Turn Metric means that a turn of any disk by any amount is a single move. The Quarter Turn Metric means that only 90 degree turns are single moves. The table shows it can always be solved in at most 8 face turns (6.2089 on average) or 9 quarter turns (7.1480 on average). Of course any solution of the normal Rubik's Cube can be used. I will give a solution below that takes advantage of the fact that this puzzle is so much simpler than the cube. I will use the standard notation for cube moves, as introduced by David Singmaster. Let the faces be denoted by the letters L, R, F, B, U and D (Left, Right Front, Back, Up and Down). Clockwise quarter turns of a face are denoted by the appropriate letter, anti-clockwise quarter turns by the letter with an apostrophe (i.e. L', R', F', B', U' or D'). Half turns are denoted by the letter followed by a 2 (i.e. L2, R2, F2, B2, U2 or D2). Phase 1: Solve the orange middle layer. 1. Turn the whole puzzle around its vertical axis so that the front-right piece in the middle layer is not orange. 2. Turn the top layer so that an orange piece is at the front. 3. Do the moves R U' R' to put the orange edge in the middle layer. Repeat step a until there are no orange pieces in the top layer. Turn the puzzle upside down, so that the bottom layer becomes the top layer. Repeat step a until there are no orange pieces in the (new) top layer. As there are no orange pieces in the top or bottom layers, the middle layer should now be completely orange. Phase 2: Solve the edges (rectangles). 1. Turn the top layer to bring an incorrect edge to the front. 2. Turn the bottom layer to bring an incorrect edge to the front. 3. Do F2 to swap the two incorrect edges. Repeat step a until all edge pieces are correct. Phase 3: Solve the corners (triangles). 1. Turn the top layer to bring an incorrect corner to the front-right. 2. Turn the bottom layer to bring an incorrect corner to the front-right. 3. Do U F U D B L R B to swap the two incorrect corners. Repeat step a until all corner pieces are correct.